Hey everyone! I know I said that I would post at least once every two weeks, but today when I finally had the chance to write a post, I realized that it had been almost a month since I last posted. Whoops. Anyway, I’m not sure if I can commit to a solid schedule for this blog due to other commitments, but I guess you should expect sporadic posts at least once a month? Alrighty, let’s get on with the review! This book is honestly an aesthetic. Even teens my age who aren’t big readers have been picking this one up, showcasing it on their Instagram and VSCO pages for its beautiful poems and aesthetic features, such as its little artsy diagrams inside. After seeing picture after picture of this book on social media and hearing good things about it within the blogosphere, I decided to join in on the hype and see what this book was all about, so I fetched myself a copy. 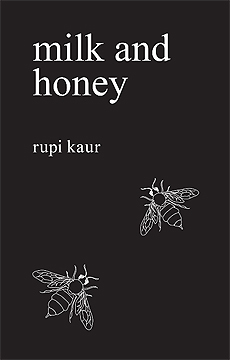 To keep it brief, I find myself nodding in agreement with everything positive that people say about this beautiful book, and I will not hesitate to pick up more of Rupi Kaur’s gorgeous writings! For me, this book was a tad of a leap outside of my comfort zone- I am used to mainly reading fluffy contemporary stories that do not dwell on deep societal and psychological issues, and I am definitely not used to poetic prose. However, I do not regret stepping outside of my comfort zone for this book in the least. Milk and Honey opened my eyes to so many thoughts I never even knew I had about society and my own self, and books that teach me new things are beautiful creatures. If you are looking for a book to fuel your inspirations, then let this one be it. Many poems in Milk and Honey chronicle author Rupi Kaur going through hardships in her life, be it pain, heartache, abuse, or family troubles, but one of her main focuses is the fact that all negative situations can be turned into positive ones through the life lessons learned. This book inspires readers to turn lemons into lemonade, and to turn honey into honeydew (alright, maybe that’s little over the top)? Another valuable lesson readers can take from this book is to do unto others as you would like done to yourself- Kaur explores the balance between being selfless and selfish, which is a quite important subject that should be explored more in society today. Overall, Milk and Honey was a beautiful read with a gorgeous prose, impeccable writing style, and meaningful themes ranging from loyalty, to self-appreciation, to treating others with respect. Though the themes are mature and may go over the heads of tweens and younger teens, I would not hesitate to recommend this precious book to older teens and young adults, who will be able to appreciate it for the deep beauty it really is. It’s great to hear from you again, love! Great review! I’m glad to see that you enjoyed this one! I too, have seen it EVERYWHERE on social media, so perhaps I should check it out some time. Hahaha. Good review! Been wanting to read this for awhile but never gotten to it. But I will definitely try to get to it soon because of the positive things you wrote about it and all the other people talking good about it. Great review Kayla! I also adored this collection of poetry, it’s so beautiful! Also I love your blog design!! I’ve been the worst at blog hopping because I’ve been overseas and have had uni exams so I don’t know how long you’ve had it for, but it looks amazing!